Mahmoud Ahmadinejad, the Iranian president, and Ayatollah Ali Khamenei, the supreme leader, do not fear the US but rather their own people's desire to live in a country more like the US. In fact, in poll after poll Iranians have revealed themselves to be among the most pro-American and pro-democratic people in the Muslim majority world. The Iranian government needs little excuse to beat, jail, and otherwise punish its citizens. It is already doing a thorough enough job without US interference, and seems poised to go even further. However, if it goes too far it risks "losing legitimacy in the eyes of its own people," as Obama said at a June 25 press conference. Obama is acutely aware of the real reason why he cannot be too forceful in supporting the millions of Iranians demanding to have their votes counted. The problem is not with US administrations long past, but with the policies of the current administration. The fact is that the US counts as its closest allies in the Middle East regimes who routinely rig elections - if they even bother to hold them at all - which produce governments that are far less legitimate than Ahmadinejad's today. No mention of Iraq and Democracy though. Home to the Persian Ayatollah Sistani in Najaf preaching clerics should stay out of government. But at least LeVine got the Iranian people right: the most pro-American and pro-democratic people in the Muslim majority world. According to last week's Washington Post, the public option is the "crux" of the health-reform debate and the "greatest challenge" for Senate negotiators to overcome. That's an accurate description of the current political scene, but it's true only because so many people, including members of Congress, are responding ideologically to the idea of government involvement. Are they open to all employers and individuals -- required, in fact, for employers below a given size -- or open only to the individual and small-group market? Do the exchanges have the power to risk-adjust the premiums paid to health plans? Can they regulate the marketing strategies and benefit designs of private insurers? The public plan will likely end up as a dumping ground for high-cost, mostly low-income people if the exchanges are open only to the individual and small-group market and have inadequate power to risk-adjust premiums or to regulate private insurers' marketing and benefit design. In other words, we could get a public plan that instead of "disciplining" private insurers, as the president said last week, actually buttresses their dominance of the system. Watch what you wish for. HUNTLEY — The village board has taken another critical step toward bringing a Metra commuter railway station to Huntley. As part of a Regional Transit Authority requirement, the board approved and accepted the transit station site selection guidelines study as prepared by The Lakota Group and Civiltech Engineering. The Progressive Fox: Has anyone else been wondering whether Bill Foster is running for re-election or not? A new Political blog for the Fox Valley or folks I've just overlooked? A long post speculating on whether one term's left Foster fed up with the job. Good news. Detainees aren't criminals. They should not be sent to sham trials than locked for life in super maxes. They're combatants (fighting outside the rules of war) but when captured, best held for the duration until OBL issues the Fatwa of Surrender. Today, Congressman Bill Foster (IL-14) released the following statement after the House of Representatives voted on H.R. 2454, the American Clean Energy and Security Act. Foster voted against the legislation, which passed the House by a vote of 219-212. 'Cause this attitude is going to kill us in Illinois... and America. Illinois Review: Will Foster Get Off the Fence and Vote for Job-Killing Energy Tax? Washington- As Congress prepares to vote for Nancy Pelosi’s disastrous National Energy Tax, it appears that Bill Foster (D-IL) still has not taken a stance on the bill. A new study reveals that this legislation will cost Foster's Illinois congressional district alone over 4,600 jobs. So why hasn’t Bill Foster taken a firm stance? With the vote coming soon, Illinois voters are once again left to wonder if Bill Foster will finally stand up against Nancy Pelosi’s job-killing agenda. Unfortunately, with the San Francisco Speaker pushing hard for votes, it looks like Illinois will lose once again. A backhanded tax and then a no bid payout to the Tribologists to characterize automatics. Can they replace those 4,600 lost jobs? Filibusters are not allowed in the House. They’re a province of the Senate. But House Minority Leader John Boehner (R-OH) may have figured out a way to get around that prohibition Friday as the House inched closer to voting on a controversial energy and climate change bill. Overnight, House Democrats tacked onto the bill a 300-page amendment. So when Boehner took his time to speak against the package at the end of the debate, the Ohio Republican then decided to peel through major portions of the bill and read them aloud before his House colleagues. Note Kimberely Stassel today in WSJ, The Climate Change Climate Change, The number of skeptics is swelling everywhere. Modern Liberalism stiffing the worker with a gross regressive tax in the name of flaky science. What happened to the FDR days of buidling damns and TVA in the name of cheap electricity for everyone? Democrats aren't what they used to be. A huge regressive tax hitting poor people hardest. Not exactly FDR's TVA power for the masses. The reality is that cost estimates for climate legislation are as unreliable as the models predicting climate change. What comes out of the computer is a function of what politicians type in. A better indicator might be what other countries are already experiencing. Britain's Taxpayer Alliance estimates the average family there is paying nearly $1,300 a year in green taxes for carbon-cutting programs in effect only a few years. Americans should know that those Members who vote for this climate bill are voting for what is likely to be the biggest tax in American history. Even Democrats can't repeal that reality. Obama displayed moral realism and principled respect for the courage, dignity and sovereignty of the Iranian people. He did what Iranian expert Trita Parsi advised: condemn violence, without picking sides. McCain wouldn't say which side of the struggle he thought Obama was on. "Between Ahmadinejad and the reformers, do you think there's any doubt what side President Obama is on?" McCain (R-Ariz.) was asked by the Huffington Post. "What would be the advantage...?" "I know what side I'm on," McCain cut in. "I'm on the side of the people. I'm not on Ahmadinejad's side or Mousavi. I'm on the side of the Iranian people and I'm on the right side of history. And I'm not going to walk on the other side of the street while people are being killed and beaten in the streets of Iran." McCain said Obama's reaction wasn't equal to the situation. "We can't sit by and watch a film clip on television of a young woman bleeding to death and say that we're worried about the Iranian reaction or our ability to negotiate with them. We have to stand up for those people," he said. God save us from the Moral Realism that ducks picking sides. ...has been able to maintain silence about so much, that it is difficult to say what has been more pernicious in the course of time, the intolerance which committed the wrongs or the indifference which beheld them imperturbed. Pitney asked his arranged question. Reporters looked at one another in amazement at the stagecraft they were witnessing. White House Chief of Staff Rahm Emanuel grinned at the surprised TV correspondents in the first row. Rahm, if everyone knows, it's not very slick.... don't grin for **** sakes. Geez we could be a little more saavy here...don't make Chicagoans look like bumpkins on the world's press stage. Iranian opposition leader Mir Hossein Mousavi is expected to attend at a rally Wednesday amid an intensifying government crackdown on protesters following the country's disputed presidential election. Mousavi's attendance is noted on his Facebook page, and there is speculation that former President Mohammad Khatami also will attend the rally, scheduled for 4 p.m. (7:30 a.m. EDT) in Tehran's Baharestan Square, outside of the Iranian parliament. Also on Mousavi's Facebook page, online supporters have posted that peaceful protests will be held at the same time in over 15 countries and 10 American cities. CNN is reporting clerics joining the demonstrations now. A picture of the white turbans with the crowds. I think it would have been wiser for Obama to have waited until after the elections before sending these guys the long discussed letter. Prior to this month's disputed presidential election in Iran, the Obama administration sent a letter to the country's supreme leader, Ayatollah Ali Khamenei, calling for an improvement in relations, according to interviews and the leader himself. Ayatollah Khamenei confirmed the letter toward the end of a lengthy sermon last week, in which he accused the United States of fomenting protests in his country in the aftermath of the disputed June 12 presidential election. How stupid do we look for the Prez to toss this whopper. Like Polluters aren't going to pass it on to you and me? Face it, we're all polluters and unless were going to live like pioneers (and I'm not certain how green that was) we're going to have to get beyond sticking it to one-another, and take the time to think the costs-and-benefits through. Want a referral to a specialist and thou shall't have to jump through a bunch of hoops for sure. Dr. Quentin Young, a prominent Chicago physician and a longtime champion of liberal causes, has strict rules on the number of Medicaid patients he will see because otherwise, he said, "I'd go broke." A system Liberals create, then will disdain to us; or God forbid, treat patients covered under this governmenet option 'cause they'd go broke. Thou shalt not go broke (despite what they've the State of Illinois) their first commandment for themselves. Mohammad: Excuse me, sir. I have a message for the international community. Would you please let me tell it? Mohammad: Americans, European Union, international community, this government is not definitely — is definitely not elected by the majority of Iranians. So it’s illegal. Do not recognize it. Stop trading with them. Impose much more sanctions against them. My message…to the international community, especially I’m addressing President Obama directly – how can a government that doesn’t recognize its people’s rights and represses them brutally and mercilessly have nuclear activities? This government is a huge threat to global peace. Will a wise man give a sharp dagger to an insane person? We need your help international community. Don’t leave us alone. Chetry: Mohammad, what do you think the international community should do besides sanctions? Mohammad: Actually, this regime is really dependent on importing gasoline. More than 85% of Iran’s gasoline is imported from foreign countries. I think international communities must sanction exporting gasoline to Iran and that might shut down the government. 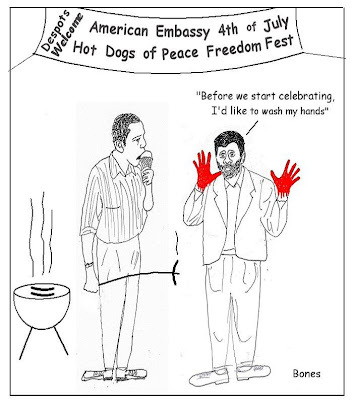 The United States said Monday its invitations were still standing for Iranian diplomats to attend July 4 celebrations at US embassies despite the crackdown on opposition supporters. Here is his ID card apparently via Matthew Bagher's facebook. Paglia from a few weeks ago. Within the U.S., the Obama presidency will be mainly measured by the success or failure of his economic policies. And here, I fear, the monstrous stimulus package with which this administration stumbled out of the gate will prove to be Obama's Waterloo. All the backtracking and spin doctoring in the world will not erase that major blunder, which made the new president seem reckless, naive and out of control of his own party, which was in effect dictating to him from Capitol Hill. Government can do little to help the economy but it can do a whole lot to hurt things. The stimulus package will do little to help (it was all politics and little economics) and just tied the Prez's hands on future policy especially health care. I think in time Paglia will be proved right here and it will be seen as the huge mistake made right at the starting gate. Regime Change Iran is back! Welcome back... they have some of the key links to follow what's happening. PS My latest posts here, here, and here. وقال "القرار الأول المشترك وعرض رئيس بيرمان يعطي صوت لعدد لا يحصى من الأميركيين الذين يقفون مع المنشقين الإيرانيين كما ندافع عن الحرية". "هذه لحظة هامة للمؤتمر ، في بلدنا وشعب ايران" ، وقال بنس. "منذ ايام لمئات الآلاف من المعارضين الى الشوارع في ايران في دعم الحرية والديمقراطية. الاميركي هو السبب في ذلك الحرية وقضية الشعب الاميركي لن يكون صامتا. يشرفني ان ينضم رئيس بيرمان في تقديم هذا القرار الهام. المشترك القرار الأول ورئيس برمان عرض ستعطي صوتا لعدد لا يحصى من الأميركيين الذين يقفون مع المنشقين الإيرانيين حيث نقف من أجل الحرية. وأحث الدول الأعضاء على حد سواء على الجانب الآخر من الممر لدعم هذا القرار الهام وامل كي تنظر فيها على الفور. " "La résolution commune I et Président Berman introduit donnera voix à de nombreux Américains qui ont avec les dissidents iraniens qui se battent pour la liberté." "C'est un moment important pour le Congrès, notre pays et du peuple d'Iran", a déclaré Pence. "Pour les jours des centaines de milliers de dissidents ont pris les rues de l'Iran en faveur de la liberté et la démocratie. La cause américaine est la liberté dans cette cause et le peuple américain ne sera pas le silence. Je suis très honoré de se joindre à l'offre Berman Président de cette importante résolution. La résolution commune I et Président Berman introduit donnera voix à de nombreux Américains qui ont avec les dissidents iraniens qui se battent pour la liberté. J'exhorte les députés des deux côtés de l'allée à l'appui de cette résolution importante et je l'espère, pour son examen immédiat. " I've been blogging most of it here. لقد المدونات أكثر من هنا. HT GateWay Pundit who becomes indespensible read at times like these. Even while supporting the president's approach, senior members of the administration, including Vice President Joseph R. Biden Jr. and Secretary of State Hillary Rodham Clinton, would like to strike a stronger tone in support of the protesters, administration officials said. It sounds as though Biden and Mrs. Clinton are "supporting the president's approach" in only the most pro forma way. It is extraordinary that the two most senior administration officials apart from the president himself are airing their objection to his policies in this way. We ask Google to change Google logo for one day. Support the idea here. HT to The Guardian's live blog. Gateway Pundit interviews Kianoosh Sanjari here. ** Ayatollah Khomenei's grand-daughter was arrested during a recent demonstration. ** Former President Rafsanjari's daugher marched in the protest tonight in Tehran. 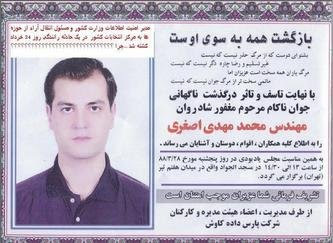 ** On the night of the election after his vote Rafsanjari called on the people to demonstrate. ** There is a great split between the two factions of hardliners and moderates. It is reminescent of the 1979 revolution. ** The people of Iran will not forgive Barack Obama for siding with the evil regime. ** Even the soccer players protested today during their match with South Korea. The coach protected his players by telling the Iranian press that the team was wearing green armbands because of religious reasons- that the players were actually showing their faith. But, this was the first time the team has ever worn green wristbands, ever. ** The protesters are communicating anyway they can. The regime has been trying to shut down communications. At the rally each day the protesters carry signs that announce the next rally. This is how they are communicating. ** Thousands of doctors and nurses in their uniforms were protesting in the street yesterday. ** The regime has a list of reporters and websites and have threatening the reporters on their list. 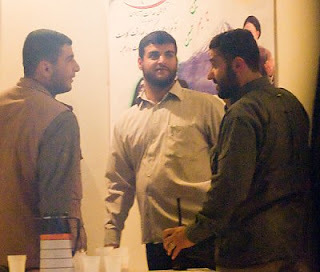 ** There is a cyber-war going on in Iran today between the moderates and the hardliners. Each group is trying to take down the other groups websites. ** Ayatollah Khameini had no idea the protests and reaction by the people would be so great. ** The Opposition wants to drag the protests out until Friday. Khameini will likely congratulate Ahmadinejad. Then it will be up to the West to decide if they will allow these savages to continue their rule. ** Kianoosh has contacts in Iran who are feeding him information daily. ** Everywhere you go everyone is talking. They are talking in the streets. They are talking on busses. They are talking on trains. They are telling nasty jokes about the regime. One joke is about Mahmoud not being able to bathe for a week. Never before have Iranians been so openly disrespectful of the brutal regime. ISLAMABAD, June 15 (KUNA) -- A Pakistani Federal Minister Monday said that militants were using kidnapped children as suicide bombers across the country. Federal Interior Minister Rehman Malik talking to newsmen here said that the militants were buying innocent children for few hundred thousand rupees and using them to carry out suicide attacks. We will try to get more details later. A cross post from Spirit of Man, and also Winston's latest update from Teheran. In the United States: Get on the phones. Call your US Congressmen/women and demand they issue statements in support of the Iranian people. Remind them of Iran Freedom Support Act of 2005. Make sure to be polite and courteous. Call your senators and demand they be tough with the regime. In Canada, UK, Holland & other European countries: Call your respective Members of Parliament. Demand they press their respective governments not to negotiate with the Iranian regime. Be polite and ask them kindly to issue statements in support of the people of Iran's quest for democracy and liberty. You can call or write to your media and ask them to cover the Iranian regime's brutal crackdown of the peaceful protests in any way they can. This is a media war. This is the information war. All of you regardless of your location can spread the word. The regime fears nothing like information. That's all I can think of now but if you've comments or suggestions, please share them with me. You can find local pro-freedom rallies arranged by Iranian expats in your town/city and show up as a sign of support. Trust me, it is very heart warming for Iranians to see you care. All of us need to be encouraged and I am sure your presence provides that for those who are fighting the regime. Thank you! “I come to this floor at an extraordinary moment on the global stage. “According to the Islamic Republic News Agency, the official news agency of Iran, President Mahmoud Ahmadinejad supposedly won the election over his primary opponent on 12 June, 2009. But from the very moment that that election result was announced, the international community and the international press called it into question. The basis for that, even before the extraordinary demonstrations had begun to take place, was the fact that these were paper ballots. But the official government results of the election were announced literally within hours of the polls being closed. Various media outlets around the world questioned the authenticity of the results. “Mr. Mousavi, the defeated candidate, has launched a legal appeal against the election results. On the day of the election, mobile phone communications were interrupted. 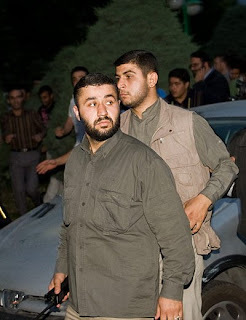 Western media has reported, ‘heavy electronic jamming, disturbing broadcasts.’ News websites were reportedly blocked by Iranian authorities and the Iranian government has allegedly arrested opposition political figures and journalists. The Iranian government has outlawed any protest following two days of extraordinary unrest. 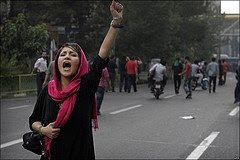 The BBC recently reported that recent rallies in the streets of Tehran were the biggest demonstrations in the Islamic Republic's 30-year history. “The protest, according to news reports, became violent and, according to media reports, pro-government forces attacked demonstrators in the last 24 hours, causing at least one fatality. We are witnessing a Tiananmen in Tehran, and the United States of America must stand in the gap on behalf of those brave Iranian citizens who are standing for free and fair elections, democracy and basic rights. “Freedom in fact may be flowering in Iran as hundreds of thousands rally for democracy and free elections. While I appreciate President Obama's comments yesterday at the White House that he was, ‘troubled by the violence,’ and his belief that the voices of the Iranian people should, be ‘heard and respected,’ it seems by my lights that this administration has yet to express the unqualified support of the American people for those who are courageously taking to the streets for free elections and for democracy in Iran. “Let me say from my heart, the American cause is freedom and in this cause the American people will not be silent, here or abroad. If the President of the United States won't express the unqualified support of our nation for the dissidents in the streets of Tehran, this Congress must. “Today I'm introducing a resolution that will do just that. It will express its concern regarding the reported irregularities of the presidential election of 12 June, 2009. It will condemn the violence against demonstrators by pro-government militia in Tehran in the wake of the elections. It will affirm our belief in the universality of individual rights and the importance of democratic and fair elections. And lastly, and most importantly, it will express the support of the American people for all Iranian citizens who struggle for freedom, civil liberties and the protection of the rule of law. “Believe it or not in my small town of Columbus, IN, I grew up next door to a Hungarian immigrant who fled Hungary in the wake of the Soviet repression of the Hungarian revolution in 1956. I sat often with Julius Perr, now passed away, and heard of the way the Hungarian people, inspired by our calls for freedom, stood up for their own freedom. And as Brett Stephens recounts in today's Wall Street Journal we stood by idly. We didn't want to interfere. And the Soviet tanks rolled. “We cannot stand idly by, speak of Iran's sovereignty, speak of her own right to choose her own leadership at a time when hundreds of thousands of Iranians are risking their lives to stand up for free elections and democracy. “Ronald Reagan said, ‘No arsenal, or no weapon in the arsenals of the world, is so formidable as the will and moral courage of free men and women.’ All of us desire a fresh start with Iran and it seems from news reports and the extraordinary images coming from the streets of Iran that millions of Iranians long for a new start in their government. There is a reformist movement afoot in Iran. Does Mousavi even want to change the system? I think he does, and in any event, I think that’s the wrong question. He is not a revolutionary leader, he is a leader who has been made into a revolutionary by a movement that grew up around him. The real revolutionary is his wife, Zahra Rahnavard. And the real question, the key question in all of this, is: why did Supreme Leader Ali Khamenei permit her to become such a charismatic figure? How could he have made such a colossal blunder? It should have been obvious that the very existence of such a woman threatened the dark heart of the Islamic Republic, based as it is on the disgusting misogyny of its founder, the Ayatollah Khomeini. 1.Stripping Ayatollah Khamanei of his Supreme Leadership position because of his unfairness. Fairness is a requirement of a Supreme Leader. 2. Stripping Ahmadinejad of the presidency, due to his unlawful act of maintaining the position illegally. 3.Transferring temporary Supreme Leadership position to Ayatollah Hussein-Ali Montazery until the formation of a committee to reevaluate and adjust Iran’s constitution. 4. Recognizing Mir Hossein Mousavi as the rightfully elected president of the people. 5. Formation of a new government by President Mousavi and preparation for the implementation of new constitutional amendments. 6. Unconditional release of all political prisoners regardless of ideaology or party platform. 7. 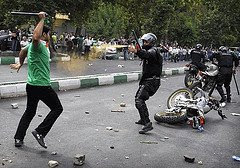 Dissolution of all organizations - both secret and public - designed for the oppression of the Iranian people, such as the Gasht Ershad (Iranian morality police). Sen. Dianne Feinstein, chairman of the Senate Select Committee on Intelligence, abruptly canceled a campaign fundraising lunch scheduled for Wednesday after the Washington lobbyist helping to organize the event suggested in an invitation that the committee's work would be served as the "first course." The Illinois senator's 2008 financial disclosure statement shows he sold mutual-fund shares worth $42,696 on Sept. 19, the day after then-Treasury Secretary Henry Paulson and Federal Reserve Chairman Ben Bernanke urged congressional leaders in a closed meeting to craft legislation to help financially troubled banks. The same day, he bought $43,562 worth of Berkshire Hathaway's Class B stock, the disclosure shows. I would think there's a day's lag between order and sale, so if Durbin sold the day after talking to Paulson and Bernanke, he placed the sell-order the day he talked. That's a guess, but I'd be surprized if not true. So much for transparency...Walpin-Gate on the canned AmeriCorps Inspector General Gerald Walpin over at RBO. Fun fact: Whereas The One was “shocked and outraged” by the murder of George Tiller, the most he can muster here for mass beatings and cold-blooded killings across Iran is that he’s “troubled.” Make of it what you will. via Gateway Pundit. I couldn't get the audio to work. I'm in a rush but clipped extensively from Winston's post. The last link has a huge list of powerful pictures. Just talked via phone with a very close friend of mine in Tehran. He explained to me that the people in the streets are 'extremely angry' with the entire system. Though he pointed to me that if the regime resorts to more violence or kills the people, then the reformist minds will shift into 'regime change' mode sooner or later. I am supposed to get in touch with him within the next 8-9 hours to have more updates for you after he's back from the planned rally today. 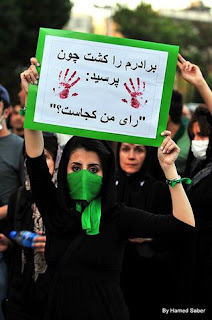 My friend emphasized on the growing anger of the people in the streets of Tehran. He said people do feel they are cheated. 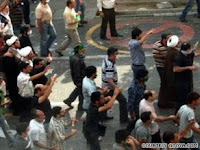 Saeed Valadbaygi: Iran: Riot in tehran streets after election day(4) Third day! 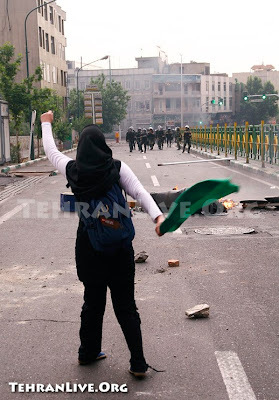 +++Le Monde, first daily newspapers in France, selectionned the two best blogs of reference for pictures on the riots in Iran. One of them is comrade Saeed Valadbaygi's Revolutionnary road! J Rubin: Don’t Iranians Deserve “Hope and Change” Too? The Iranian election has given the world a jolt of reality. For those confused about the nature of the Iranian regime, its true colors are now revealed. But it has also been a clarifying event in America. It has been obvious for some time that the American Left has given up on democracy and human rights as fundamental tenets of American foreign policy. But never before has it been so clear just how ruthless and indifferent they are to the aspirations of those who would be crushed by the boot of despotic regimes. And never before have we seen how Herculean a task it is to deny and obfuscate the nature of these sorts of regimes in order to pursue a policy devoted to stability, engagement, and process as goals in and of themselves (rather than as means to some greater ends). The Iranian election and its aftermath demonstrate just how vast is the difference in approach between the Obama administration, which has embodied the Left’s total embrace of realpolitik, and its conservative critics. Yesterday even before the news of Ahmadinejad's win was released I declared in my blog that something funny was going on. Today it is even more evident that something really really funny is going on. Rafsanjani's house is apparently surrounded by security forces. Let's face it Rafsanjani has the most to lose here. His and his sons head is on the line. If there is any chance that this trend is going to be reversed, Rafsanjani will be the key player. Today is the day that the Islamic Republic officially transformed from a theocracy supported by Pasdaran to a Junta supported by a handful of clerics. Whether or not the mullahs who were apparently outraged by Ahmadinejad's statements during televised debates sit on the sideline and watch remains to be seen. The people should not become pawns in this power game. Note Dan Curry's link to my post on fellow Chicagoan Carl Davidson's Barak O'Bomb'em post in RBO's latest on the anti war action in Washington State. Carl, who in the world would of thought all of the tired old reds in Chicago would become such national links? Geez, you would think they could have just called Cal and straightened it out. Pat Murfin covers the North West Hearld's suit against Cal Skinner. Obama, please help us, they are killing our young children. A Michael Goldfarb post I've clipped in full. According to our private phone conversations with people in Tehran, hundreds of parents have gathered by a police station in Yousef Abad, now known as Seyyed Jamal Aldin Asad Abadi, with their hands raised to the sky saying “Obama, please help us, they are killing our young children.” They were gathering there because their kids are missing and they were trying to find out where they are. It's hard not to see a parallel here between candidate Obama's slow response to last summer's crisis in Georgia and his administration's reluctance to wade into the Iranian election, presumably for fear of driving the opposition into the arms of the regime. But wasn't Obama's election supposed to restore America's moral authority precisely so that the United States government could use soft power and diplomacy in a situation like this? What is Obama doing to help those who are seeking change in Iran? Or has opposition to regime change morphed into support for stability, even if that means support for Ahmadinejad? I've been posting on Unitarian Universalist blog here, here, and here. He's ruthless. In a recent interview with the New York Times, Obama described his economic policy as "ruthless pragmatism." Interesting choice of modifiers. Obama has a healthy disdain for the overrated virtue of political loyalty. Around the nomination process, this has been slightly chilling to watch. If you're useful, you can hang around with him. If you start to look like a liability, enjoy your time with the wolves. Before the inauguration, Christopher Hitchens described Obama as feline in his demeanor. The president is catlike also in his lack of evident affection for the people who take care of him. His cracks at the White House Correspondents' Dinner about Hillary Clinton being an envious loser, Larry Summers' woman problem, and training his dog not to pee on Tim Geithner skirted cruelty. Obama's jokes about himself were about how great everyone thinks he is. To be sure, there is no one in Washington today who can match Zal's impeccable credentials, having seen it all in Iraq, and knowing like the palm of his hands the ethos and traditions of the Pashtun tribes. Certainly, he will take his stance to the right of McChrystal. When the tough special forces commander hits the Taliban hard, rubbishes them and makes them "reconcilable", and when the "chameleon insurgents" - as Petraeus calls them contemptuously - begin to peel away, he will pass them on to Zal. Zal will carefully roll up his sleeves, sit down with them over a cup of green tea, and talk some sense into their dazed minds. And then, he will make a mental note as to the fastness of the color of the "chameleons" facing him and looking at him with their watery eyes, before short-listing them for future assignments. That is, until a job falls vacant for Zal himself - in the presidential palace in Kabul. Post: As the commander of the US Central Command, you're the big-picture "strategy guy." Could you give readers a clear statement of our mission in Afghanistan? Petraeus: The mission is to ensure that Afghanistan does not again become a sanctuary for al Qaeda and other transnational extremists. That's what it had become before the operations conducted in the wake of 9/11. Al Qaeda wants to carry out further attacks on the US and our allies, and we need to deny them safe havens in which they can plan and train for such attacks. ...and the book he's been reading. Cathy Young on Hate Speech. Lynn Nelson's short stories about Chicago. I like the one about 63rd street. My Dad had a dime store there, at 63rd and Blackstone. Vote with your Feet reviews 'em all. A great blog if you like Chicago architecture. The official blog of urbanist, writer and architecture critic Lee Bey. The blog features observations, photography, video links and all things dealing with Chicago's built environment (or anything else that interests me). Bill Foster D - Ill 14th was not one of the 95 Democrats who put themselves in a tough spot. Foster's tough spot comes if what Generals Petreaus and Odierno fear comes to pass. (Washington, DC) – Today, Congressman Bill Foster (IL-14) will attend the White House signing ceremony of the Ronald Reagan Centennial Commission, H.R. 131. Foster is a co-sponsor of this bill, which passed the House of Representatives by a bipartisan vote of 371-19 in March of this year. The Commission will plan and carry out activities to honor Ronald Reagan on the occasion of the 100th anniversary of his birth, and will also provide assistance to federal, state, and local governmental agencies and civic groups to carry out such activities. Nader's got a point. Beware Obama's unaccountable task forces.... and Congress abdicated it's duties long ago. About they time they reversed themselves on Iraq and decided their decisions were Bush's bamboozlment. They've been irresponsible ever since. Today's bankruptcy declaration in federal court by General Motors is an avoidable, crude weapon of mass devastation for workers, dealers, auto suppliers, small businesses and their depleted communities. For GM's voiceless owners -- the common shareholders -- it is a wipeout. The proximate cause of the bankruptcy was supposed to be the inability of GM and the government's auto task force to reach an accommodation with GM's bondholders. But late last week, the bondholder problem was moving toward rapid resolution, and was clearly resolvable. Why then are GM and its multibillion government financier proceeding with bankruptcy? The bankruptcy and the GM restructuring plan are the product of a secretive, unaccountable, Wall Street-minded government task force that assumed power because of a Congressional abdication of historic magnitude. By all rights, the restructuring plan should have been submitted to Congress for deliberative review and decision.